Remote Technologies Incorporated (RTi) is a technology-driven company that specializes in developing and marketing innovative home theater control products. RTi is best known for pioneering the development of affordable, customizable, wireless remote controls that incorporate touchscreen displays. RTi's guiding passion is to create products that transform any home theater (or other audio/video system) into a truly pleasant experience - each and every day it is used. Achieving this result requires a great deal of innovation, and an unusual commitment to every detail of product design. A product that is usable, durable, and reliable. Rti demand's that the product experience not only be functional, but also enjoyable. 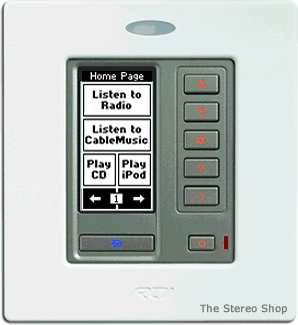 The RTi RK2 provides homeowners who want a simple and stylish way to control their home's electronic systems. The RTi RK2 balances form and function perfectly, since it is powerful enough to manage any size system while discreetly blending with a home's interior. 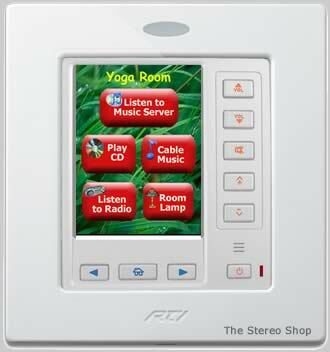 And because the user interface is so intuitive, it is easy for anyone to enjoy precise control over their entire home systems, even if they've never used an in-wall touchpanel before.The RTi RK2 is a cost effective touchpanel designed for flush-mount installations in walls or cabinets. It provides a self-contained control system for controlling audio/video components. In addition to the seven programmable keypad buttons, the 2.4" high-contrast LCD displays custom text and graphics, providing the flexibility to customize it for each installation. The new display and backlight make the graphics extremely sharp and vivid. Easy-to-read LCD to display custom buttons, text, and graphics. Stylish low-profile faceplate with snap-on attachment. Available with gray or black front plate and buttons. Seven assignable/programmable pre-labeled keypad buttons. The Stereo Shop is a Remote Technologies Certified Level 1, 2, and 3 Programmer and has invested over 28 years in custom programming control systems that are easy to use. With today's increasingly sophisticated equipment, this is more important than ever. There can be a lot of incompatibility among today's audio/video equipment. Many systems will have trouble working together, or simply don't have the control capability needed to program a system that is easy to operate, resulting in a poor customer experience. That's why The Stereo Shop limits programming of Remote Technologies control systems with only equipment that we offer or that is on our approved list. The new RTI RK-3V In-Wall Remote Touchpanel utilizes a 3.5" color OLED (Organic Light Emitting Diode) screen for a stunning, crystal clear display that will make all of your graphics appear to leap out at you! There are nine hard buttons to control many of the most commonly used functions, such as volume control, and are backlit for effortless readability in the dark. Also, its sleek profile looks great in the wall, and offers many different finishes to compliment virtually any decor. Having a second or even third zone of music is a nice feature, but with many of today's systems, getting them to operate properly can be an issue. With the RTi RK-3V Touchpanel programmed by The Stereo Shop, you can quickly and easily operate multi-zone distributed audio systems with ease, and now your system becomes fun and enjoyable to use, instead of being a chore. All of the Remote Technologies remotes are custom-programmed by us to ensure ease of operation with no confusing "cookie-cutter graphics" that other installers use. In fact, we have over 28 years of remote programming experience, and we use our own customized graphics for a pleasurable experience every time you use your home entertainment system. High contrast, full color OLED display with wide viewing angle.